Srinagar: The J&K Police today said lathi-charge and teargas used on stranded Kashmiri passengers in Jammu city were aimed at making them feel home, and the exercise would be used liberally all along the highway, wherever they are stuck. “We have clear directions from Raj Bhavan to make the stranded Kashmiri passengers feel home and allow them to breathe in their own environment,” said MK Sinha, Inspector General of Police Jammu while addressing a presser here. 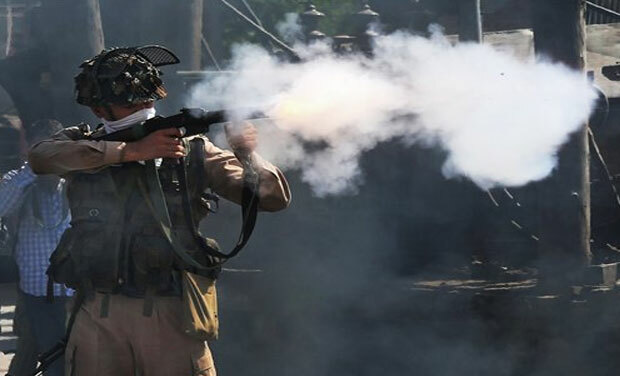 Sinha said they have sought supplies of pepper gas from Srinagar to recreate a “perfect Kashmir setting “as it was not used in Jammu. “We acknowledge that we are unable to provide them perfect Kashmir setting as we don’t have pepper shells available here. However, you must understand because of the closed highway, our two trucks laden with pepper gas shells are stuck in Ramso area,” Sinha said. Advisor to Governor, Khursheed Ganai told Dapaan he was impressed by the police’s concern to make Kashmiris feel at home. “The administration will leave no stone unturned to make stranded Kashmiris feel comfortable far away from their home,” Ganai said. Meanwhile, a video has surfaced on social media vindicating the government. The video features stranded Kashmiris who were part of the procession teargassed by police. “Initially we thought the administration was apathetic towards woes of stranded Kashmiris and for a moment we thought we are not in our own state. But after inhaling smoke from teargas shells and receiving batons, the feeling of home came back,” said Aziz Hajini, a stranded Kashmiri.